Can you believe how much warm weather we have had this year? We are pretty surprised by the number of days over 90 degrees. The two week forecast looks like more hot days with weather in the mid 90s is going to just keep coming. We have been joking that we hope it doesn’t go straight from 95 for a high to 45 for a high in mid august and stay there until we return to 8 months of snow cover. That’s a bit of a dramatic over-exaggeration but this spring really did go from abnormally cold, wet, and gray to abnormally hot, sunny, and dry. 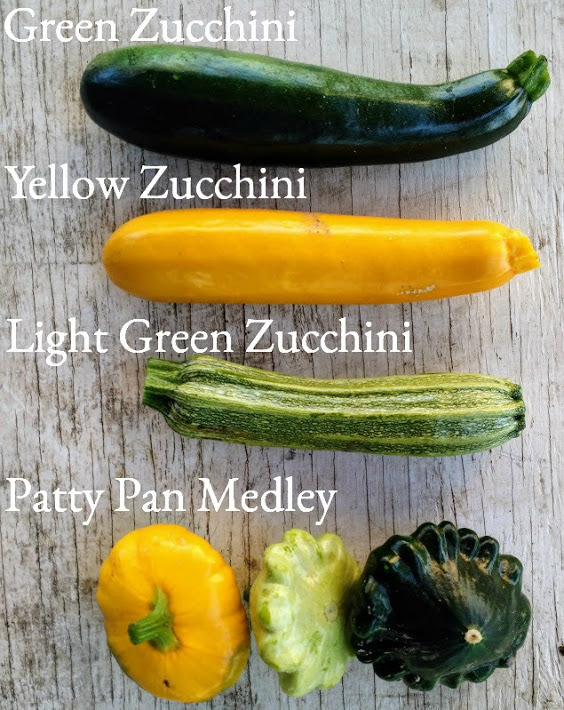 The summer crops are all thriving in the heat, especially the zucchini and cucumbers, which we are making sure to harvest at least every other day to get to them before they are gigantic. 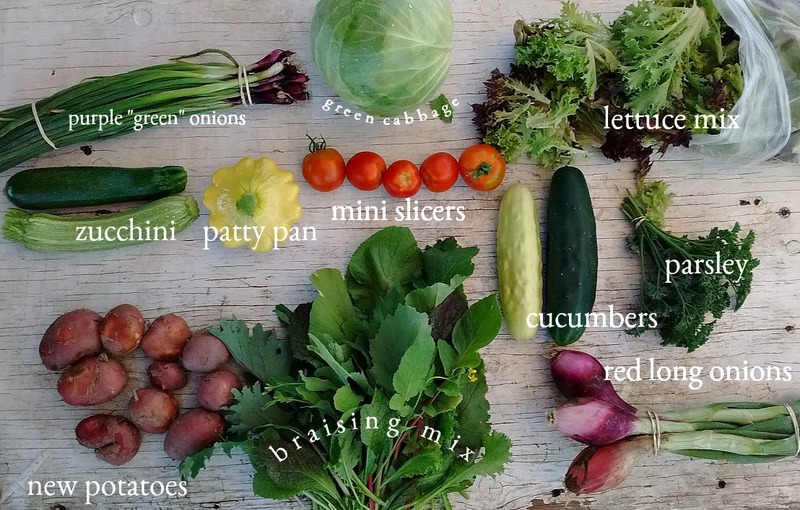 This week will be your first week for having a few non-refrigerated items in your CSA. 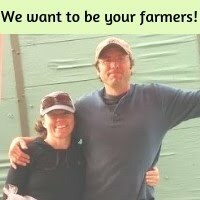 We will have these set out separate from your box at CSA pickup with a clearly marked sign. “Take One Bag of Tomatoes and One bag of Potatoes”. Don’t forget your Potatoes and Tomatoes! It happens every year . . . don’t let it happen to you! If you’ve never had fresh dug, thin skinned, new potatoes you are really in for a treat. They may need a light wash in your kitchen sink to get any stubborn dirt off, but there is no need to peel these beautiful potatoes. The potatoes don’t need to be refrigerated and can be kept in a paper bag in a dark cabinet or on your kitchen counter until you eat them this week. These are good boiled for potato salad, or pan-fried/braised (with lots of butter!!!) for breakfast, lunch, or dinner. This year we are growing 4 different types of tomatoes. We have our Mini Slicer, Large Slicer, Sungold (orange) cherry tomatoes, and red cherry tomatoes. We currently “only” grow 200 tomato plants and don’t have enough to include the same variety of tomato in all the shares every week. 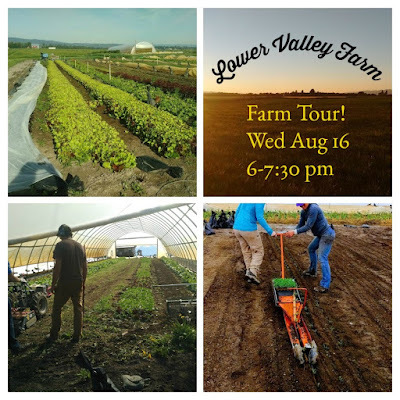 We will be alternating which type of tomatoes the full and partial shares get and keeping track to make sure everyone at every pickup site gets to try all the different varieties over the course of the season. The tomatoes are ~just~ starting to produce this week we have enough for just a few for the partials and a few more for the full shares; pints and quarts of tomatoes will be coming before you know it! We grow our tomatoes in our unheated high tunnel and carefully prune and trellis the plants for maximum yields. 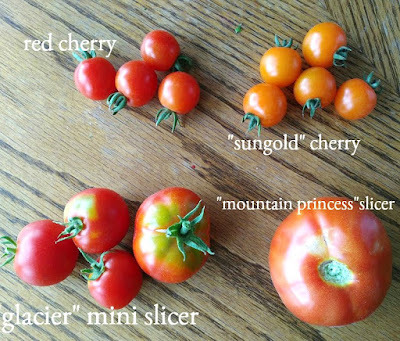 Someday we would like to add just a little supplemental nighttime heat for our slicer tomatoes. Tomatoes really need warm nights to grow well and get full flavor. Even with highs in the mid 90s we have our lovely cool nights that are easily 40 degrees cooler than our daytime temps. You never, ever, ever need to refrigerate our tomatoes. Refrigeration wrecks their flavor. Our late summer/fall nights are often just as cool as a refrigerator. It may be just me, but I think the texture changes if they get cold after they’ve come off the vine more so than if it gets cold while they are still vine ripening. In addition to green zucchini we also have a yellow zucchini, light green ‘ribbed’ zucchini, and a light green, dark green, and yellow patty pan squash. All of these can be used interchangeably and even though they all look very different they taste pretty much exactly the same. 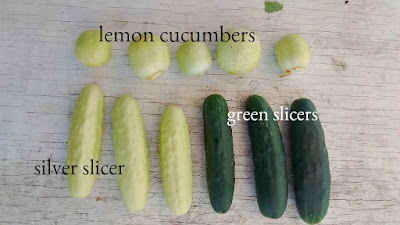 This year we cut back on the number of varieties of cucumbers we are growing. We have a green slicer, a white slicer, and lemon cucumbers. We only grow a few lemon cucumbers and when they are at full production we will make sure all CSA members get lemon cucumbers in their box at least once this year. Red Long Onions- are a french heirloom “Red Long of Tropea” and are similar to the mini onions, they are a fresh onion that is good raw, sauteed or grilled. This week’s Braising Mix is a lovely bundle of a collection of mustard and Asian Greens. I love this with eggs! Chop and saute some of your red long onions and finely chop the whole bundle of Braising Greens, saute about 2-3 minutes, add a dash of balsamic vinegar and scramble 3-8 eggs to add to the skillet. The Brasising Mix would also be good added to a stir fry or any casserole, frittata, or quiche that you usually use cooked spinach, chard, or kale. It’s going to be so hot this week I know we’ll be using our green cabbage to make a coleslaw. We love a nice rich cold coleslaw and burgers and pan fried potatoes for dinner when it’s hot.